As the weather gets a little warmer, we don't need our usual jackets. But sometimes when the sun does go down and you're walking home from work or heading out on a Friday night, you need a little something extra. I'm really loving short sleeved jackets for this type of occasion. They're casual and easy to throw on and go. A great, rich brown makes this jacket perfect for almost any outfit. I love the gathered sleeve as well. The military style jacket is something unique. Add the great mandarin collar finishes the look. This beautiful silk jacket actually has a pin point dot print that makes it much more feminine. Not to mention those magenta pants are incredible. 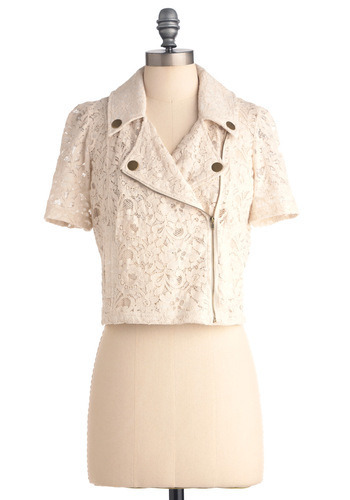 How fantastic is mix of lace and biker? So perfect for Spring. I prefer a short sleeve jacket in the warmer weather but something like the Nordstrom jacket could be layered in the cooler months. Oh I'm loving those last couple options - so cute!